Minute Taking Training Materials are designed for trainers to develop the minute taking skills of employees and managers. Confidently train your staff the role of the minute-taker, key skills, how to choose a style, record motions and resolutions and much more with the minute taker's workshop! Seeing is Believing This sample manual to teach Minute Taking Workshop is in MS Word format. Chances are, meetings are part of life for everyone. If you have students wondering about how to write meeting minutes, Velsoft's one-day minute-taking workshop will be perfect for your classroom! With fully customizable training material, trainers can easily teach students how to prepare minutes, and how to take minutes in a variety of styles to reflect the needs of their individual workplaces or associations. 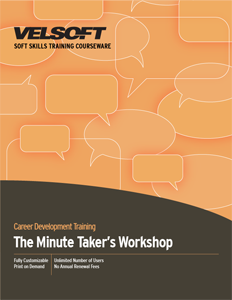 With the Minute Taker's Workshop Training Material, employees begin by learning the importance of taking effective minutes, and how to deal with the most common problems minute-takers encounter. Then, they learn the key skills of good minute-taking, like how to listen and organize their notes. Afterward, students learn how to take formal, semi-formal, and action minutes, and finally, how to edit and keep track in a minute-book. Trainers can also combine their minute-taking courseware with eLearning, a blended learning solution that uses distance learning technology so students, no matter where they are, can learn how to take effective minutes and ensure their meetings are productive!